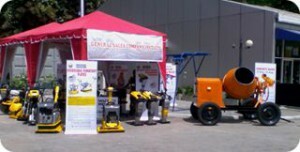 “Construct” is a leading exhibition platform in Sri Lanka for all kinds of construction and material handling machinery. Construct Exhibition is annually organized by National Construction Association of Sri Lanka (NCASL) and plays a vital role in the development of construction Industry in Sri Lanka. 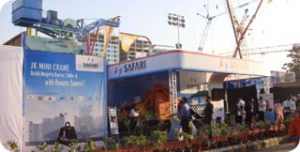 Safari Construction Equipments Outshines at Excon 2011, Bangalore. 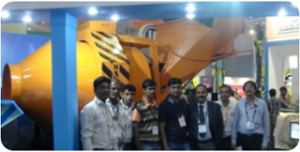 Asia’s third largest and South Asia’s largest Construction Equipment Exhibition – Excon 2011 was a huge success for Safari. It was a proud achievement to display world class products amongst 330 exhibitors including over 200 international exhibitors with over 30,000 business visitors from countries like Sri Lanka, Bhutan, South Africa, Kenya, Ghana, Singapore, Algeria, U.A.E and other Asian, African & Middle Eastern nationals. 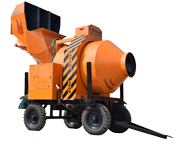 Safari Construction Equipments Pvt. Ltd., the Leading mini crane manufacturer, under the brand name of ‘JK Mini Crane’, have achieved yet another milestone. They have achieved a mega production goal with the output of 150 mini cranes every month. Since the last few months production was grappling to meet the market demand. Now with a massive team effort and introduction of new techniques in the production line have upped the production capacity by 30%. 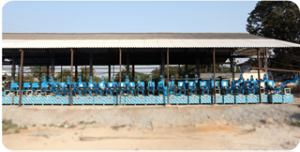 This production capacity increment indicates lesser delivery times for customers.